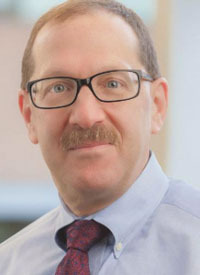 Although central nervous system (CNS) metastases occur in 1% to 2% of patients with large cell lymphoma, it is imperative to have a standard-of-care approach in place for this small subgroup, said Philip Bierman, MD. Early diagnosis of this is critical for successful treatment and improved prognosis, explained Bierman, a professor of Internal Medicine in the Division of Hematology and Oncology at the University of Nebraska Medical Center. “CNS involvement is probably there more often than we think,” he said. The NCCN, ESMO, and the Spanish Lymphoma Cooperative Group each have their own set of guidelines for how to manage this rare subgroup of patients. Arguably the most important aspect is identifying patients with clinical risk factors, he explained. Several large prospective clinical trials conducted prior to the FDA approval of rituximab (Rituxan) reported higher rates of CNS relapse in patients with increased levels of serum lactate dehydrogenase levels and/or involvement of >1 extranodal site.1 An International Prognostic Index score of >1 also appeared to contribute to CNS involvement. Several studies published in the last year have described a decrease in the rates of CNS involvement after the implementation of rituximab treatment, likely due to the improved control of systemic lymphoma. Data show that leptomeningeal relapse has also decreased due to improved disease control. Based on the guidelines from these groups, the standard treatment for large cell lymphoma with CNS involvement remains R-CHOP chemotherapy with methotrexate. Bierman stressed the importance of further analyzing optimal treatment regimens, which could include chemotherapy combined with novel agents. In an interview with OncLive, Bierman discussed the current landscape of CNS involvement in aggressive lymphoma and the research that should be conducted. OncLive: How prevalent is CNS involvement in lymphoma? Bierman: It turns out that about 1% to 2% of the time, patients with large cell lymphoma will also have CNS involvement. Sometimes, people call this concurrent CNS and systemic lymphoma. Sometimes, they say it is simultaneous. If you look at patients when they relapse, it often occurs in the first few months after starting treatment. That is the reason that if people have clinical risk factors, we should probably look a little bit harder. This could involve the brain parenchyma or the leptomeningeal compartments. Like I said, we see it very rarely; however, it is certainly there. It occurs more frequently with some more aggressive histologies. It turns out that there are guidelines on how to treat this. The NCCN has guidelines, ESMO has guidelines, and the Spanish Lymphoma Cooperative Group has guidelines. Most of the guidelines are recommending treating these people with R-CHOP with mid-cycle methotrexate, at least 3 g/m2 on day 15 of each cycle of therapy. Generally, we recommend at least 3 g/m2 of high-dose methotrexate. What are the treatment challenges for these patient populations? We don't have randomized trials. The main question is, "What's the best regimen?" There is also a question of whether transplantation helps these patients. We don't know that answer, although a lot of people are recommending it. Are there better regimens out there? For example, what [type of benefit would there be if we] combined ibrutinib (Imbruvica) with R-CHOP? What about lenalidomide (Revlimid) with R-CHOP? There is a suggestion that this may decrease the rate of CNS relapse. Most people are saying some sort of anthracycline-based chemotherapy combined with high-dose methotrexate [could be an option]. What is the main takeaway message from this area of research? This patient population can do well. Not only that, they can be cured. We should treat them according to the guidelines from one of these organizations. Another question is what to do with people who just have leptomeningeal disease. There are not a lot of prospective trials looking at this. There is some evidence that if people have leptomeningeal disease identified by flow cytometry, then we may be able to eradicate disease in the spinal fluid. For people with more florid disease, they probably require high-dose methotrexate. Penalver F, Sancho J, Fuente A, et al. Guidelines for diagnosis, prevention and management of central nervous system involvement in diffuse large b-cell lymphoma patients by the Spanish lymphoma group. Haematologica. 2017;102(2):235-245. doi:10.3324/haematol.2016.149120.